Asanka Pradeep Gurusinha who played a major role in Sri Lanka winning the World Cup in 1996 as a number three batsman, was the Observer Schoolboy Cricketer of the Year in 1985, the year he captained the unbeaten Nalanda College cricket team. World Cup winning Sri Lanka team member Kumar Dharmasena of Nalanda College who won the Observer Schoolboy Cricketer of the Year award in 1989 and also became runner-up in 1988 and 1990 contests, has taken up to a umpiring career in a big way. The 23-year-old Sri Lanka allrounder Mohamed Farveez Maharoof who is presently playing for Delhi Dare Devils team in the Indian Premier League cricket tournament was the winner of the Observer, Schoolboy Cricketer of the Year Award in 2003. One of the outstanding schoolboy cricketers from Kandy, Trinity College’s Kaushalya Weeraratne who recently represented Sri Lanka in the three one-day internationals against the West Indies was the winner of the Observer Schoolboy Cricketer of Year Award in 2000. Former Ananda all-rounder Muthumudalige Pushpakumara who won the Rs. 100,000 Player of the Tournament award in the 2007-2008 Premier League, earlier won the prestigious Observer Schoolboy Cricketer of the Year award 1999 for his fine performances. Lahiru Peiris, the St. Peter’s College Cricket captain of 2006 who is celebrates his 21st birthday today (June 1st). 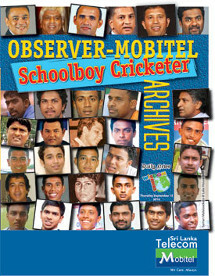 He became the first Peterite to win the Observer Most Popular Schoolboy Cricketer of the Year Contest - All Island twice in 2004 and 2005.
ormer Royal College, Panadura captain Lindamlilage Prageetha Chamara Silva, better known as Chamara Silva who played for Deccan Chargers in the recent Indian Premier League Tournament, will don the Sri Lanka cap and will play for Sri Lanka in the Asia Cup to be played in Pakistan this month. 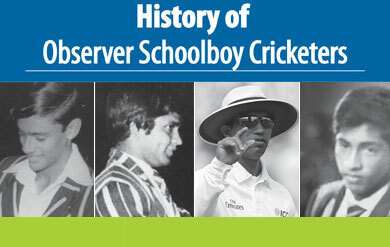 Former Ananda College captain Sanjeewa Ranatunga, the fifth of six Ranatunga brothers, became the sixth Anandian to win the prestigious Observer Schoolboy Cricketer of the Year award in 1988. The star left handed batsman, Sanjeewa had the honour of leading the Sri Lanka ‘A’ team and he also represented the country in Tests and One-day Internationals. Master-blaster Sanath Jayasuriya - a former Sri Lanka skipper, has been very much a part and parcel of inter-school cricket in the country and he excelled in cricket while at St. Servatius College, Matara and was picked as Observer Schoolboy Cricketer of the Year in the Outstation Segment in 1988.